In issue #9 we took you through some tips of the trade for selecting a dive operator that will help you properly facilitate your underwater photography. In this issue we’d like to share with you some hints and tips for getting all of your valuable camera equipment to your destination safely, and without incurring costly excess baggage fares. Checking your camera gear into the hold is often undesirable; baggage handlers are nicknamed ‘throwers’ for a reason; and the last thing you want to happen is your camera gear to arrive damaged, stopping you from shooting. You can also run the risk of getting charged large sums of money in excess luggage fares. There are however a few tricks of the trade, and loops in the system you can use to get yourself and all your camera equipment safely without incurring those costly fines. Many modern camera systems are so small that they can easily be transported in hand luggage. A comprehensive camera system such as the one pictured, which includes a wide-angle lens and an external flash unit, weighs just a few kilos. This kind of system can be wrapped in a towel or piece of foam and fitted into a small rucksack. Things can get trickier if you’re using an SLR or video system, which will generally be a lot bigger and heavier. If this is the case then because of weight and size restrictions on hand luggage you’ll probably be forced into checking a portion of your system into the hold. If this happens I’d recommend keeping cameras and lenses with you, and checking housings, flash units and lights into the hold using a reliable brand of hard case, I’d recommend Storm Cases; they’re stronger and lighter than most other brands, and they have a great range of sizes, so you’ll find something to fit your system nicely without any having wasted space inside the case. 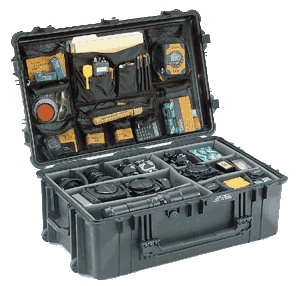 Pack cases with at least an inch to two inches between the exterior of the case and the items inside, and separate each item with a decent layer of foam to stop items knocking against each other. When repacking your box after a dive ensure all your gear is completely dry so that no water gets into the foam. If it does the foam may deteriorate over time. Even if you carefully dry all your gear, water could be stuck inside control shafts or other spaces you can’t get to. Because of this it is usually a good idea to treat a box as a dry box or wet box, you obviously don’t want to get water onto your cameras or lenses. There are a few other golden rules that I follow when transporting cameras and housings. Remove o-rings from housings- the change in ambient pressure at altitude can create a vacuum inside an underwater housing, this can be so great that it can be difficult to open the housing when you’re back on terra firma. To avoid this simply remove o-rings from the housing and keep them in a self-seal bag inside the housing. This will allow air to flow freely through the housing. Remove cameras from housings- I would recommend that you always remove your camera from its underwater housing when you’re transporting it. Knocks and jolts can move housing controls out of alignment; transport the camera separately and use the space inside the housing to keep soft bits and pieces such as o-rings in. Just don’t put heavy or sharp items inside! Try and get caps or covers for your housing and ports, this will help to keep o-ring grooves and sealing surfaces clean and stop them getting scratched. Photographers often use camera jackets carry bulky equipment when they do not want to use a bag or case. You can use these jackets when you’re travelling; they have pockets that are designed for telephoto lenses that are perfect for large flashguns, and you can fit camera bodies, cables or any other accessories in the other pockets. These jackets can come in handy when you’ve got equipment that you want to carry with you on the plane, but your carry on bag has gone over the weight allowance; having items on your person is not regarded as excess luggage. The downside is that using camera jackets can be uncomfortable, and they do not protect equipment as well as a case or bag would. For those travelling from/to/’through the US, the TSA has the right to open and inspect any checked luggage, and when your dive or underwater photo equipment goes through the main x-ray machine, you have a fairly high chance that TSA will be selecting your bags for “random inspection”. The first step is to put TSA approved locks on your baggage. The security agents can open the locks and relock your luggage. If you use standard locks and they inspect your bags, they’re getting clipped and your baggage continues to its destination with no locks at all. Another tip is adding a laminated notice to security agents, affixed to the inside of each piece of baggage, kindly asking them to be very careful when inspecting your equipment, which is very fragile and needs to be repacked the way it was originally. Make it obvious where everything fits into the case, this way whoever is inspecting your bag SHOULD put it back into the correct place, so it can continue its journey in safety. Besides the TSA locks, secure the zippers with cable ties. Hand the agents extra cable ties to replace the ones they will need to cut off when inspecting your bags. Locks and cable ties are not a guarantee, but when other bags don’t have any security, a thief focused on a quick fix will target other bags. Of course there’s nothing that’s going to stop a thief who’s targeting your equipment from stealing it. Recently there have been multiple incidents where underwater photographers travelling through San Juan Puerto Rico were consistently arriving at their final destinations only to find that their underwater photography equipment was missing. Some (probably all) of it was found for sale on e-bay. Currently we have no update on the situation in the San Juan airport. However, this example of airline security-gone-bad is the exception and not the rule. Generally speaking, locks and cable ties will help deter thieves who are trying to do their deeds quickly. Most airlines will allow extra baggage allowance to passengers carrying golfing or skiing equipment. Unfortunately this rule generally does not apply to scuba divers, although some airlines are now seeing the light. As strange as it may sound, a few divers I know actually use golfing bags to transport their dive gear or camera gear, and manage to avoid excess luggage fines that they would have otherwise incurred. Luggage going to or from the US has higher limits than other parts of the world. Excess luggage fees come in the form of ‘per excess bag’ changes. However, do not forget that when travelling between other countries, you will be charged ‘per excess lb./kg’. Regardless of the country, you bags will be weighed, and often that includes your carry on. It sounds obvious, but approaching airline staff in a polite, civil manner may carry you a long way. Smile, joke and laugh with whoever is checking you in, then ask nicely for a few kilos grace, it’ll probably work. When booking your flight ask for extra baggage allowance, you’ll often be in luck, especially if you’re booking a late flight that the airline is trying to sell. Just make sure you get in writing that they’ve changed the status of your baggage allowance, other wise you may find yourself in a situation that I’ve been in where you’ve packed more equipment than you otherwise would of, and you then get told when checking in that you have less allowance than expected! If you have a piece of luggage that you want to carry onto the plane, but you’re worried that your going to be told it must be checked into the hold, take it to the left luggage counter. After you’ve checked in simply go and collect it; the airline staff never even knew you had it and you’ll be carry it on with no problems. Racking up frequent flyer points may make you eligible for special treatment from multiple airlines, including upgrades and additional luggage allowance. Join as many frequent flyer programmes as possible, and take advantage of the special treatment. For most of us it’s out of our budgets, but when flying business or first class you’re given much more baggage allowance. The additional cost of flying in a better class can be comparable to paying for the excess luggage fines. This means you can carry more equipment with you on the plane as well as checking more gear into the hold if you want - to as well as travelling in style! Take the time to work out how much the excess luggage fines are going to cost you compared to the additional cost of upgrading. Often when flying via the states passengers are given extra baggage allowance. A sneaky way to take advantage of this is making a part of you ticket a destination in the states, even if you don’t intend on going there. Make sure that the ticket you buy if fully refundable, and then once you get home you simply claim the cost of the US portion of the ticket.